Ted Seward, ResponsePoint’s Director of Marketing and Business Development, shares his thoughts the great divide between Marketing and Sales…and how to mind that gap for a more effective team alignment and a stronger sales and marketing strategy. Too often in the marketing services industry, we see a lot of communication breakdown between Sales and Marketing strategy and alignment. And regardless of why or how this plays out, it all boils down to a simple fact: if your Marketing and Sales teams aren’t operating from the same protocols and processes, it will have a ripple effect throughout the organization—and a negative effect on your company’s bottom line. So where do businesses go wrong when it comes to alignment between the two departments? Here are some examples of potential pitfalls we often witness. If you recognize even one, there’s a good chance you need to intervene and hit the reset button. 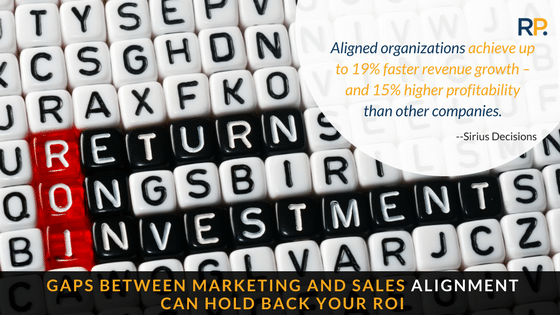 So, how can a business ensure sales and marketing alignment? The way to get sales and marketing working together is to hold them all accountable to one plan. We’re shifting away from transactional inbound clicks and hits to a more relationship-based interaction. In order to get to back to the human relationship component of marketing, alignment is critical. Simplify your process and systems, connect activities to ROI and revenue owned by the marketing and sales teams, and eliminate any existing silos, barriers or distrust to improve the team relations (and the customer journey). Aligned organizations achieve up to 19% faster revenue growth – and 15% higher profitability than other companies. Are you interested in getting your Marketing and Sales teams on the same page, building better processes and seeing a bigger ROI? Get in touch with the experts at ResponsePoint. We’d be happy to give you a free 15-minute phone consultation and answer any questions you may have. The future of marketing is human relationships. After aligning your internal teams, what are the top five steps an organization can take to steer in that direction? Follow these guidelines and your sales and marketing will be poised for acceleration. Your teams will be more efficient, sustainable, scalable and—most importantly—measurable. This is part of a five-part blog series partially excerpted from an interview Ted Seward gave to Sword and Script. You can find the original article here.